George Graham Reviews Colin Linden's "Easin' Back to Tennessee"
With the blues being deeply at the root of most rock-oriented music, there is a certain attraction that many rockers feel toward the blues. Most famously, there was the British Blues movement of the 1960s that started when some young English musicians came across records of American traditional blues artists, who ironically had faded into obscurity in the US. These young Brits absorbed Muddy Waters, Sonny Terry & Brownie McGee, and Son House and became some of the biggest names in rock -- the Rolling Stones, Eric Clapton, Led Zeppelin, even Fleetwood Mac. In recent years, the authentic blues from veteran performers has been experiencing a considerable revival, but the music still holds an appeal for artists whose main musical territory might be outside the strictly traditional. This week, we have the latest recording by a Canadian artist has had career marked by versatility, including stints as a singer-songwriter, producer, session musician, and member of a roots rock band. 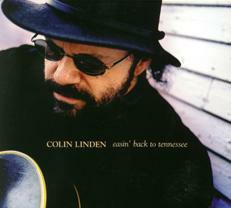 Colin Linden's new recording is called Easin' Back to Tennessee. Forty-five year old Colin Linden is probably best known south of the Canadian border as a producer, having produced over 60 albums during his career, including recordings by Bruce Cockburn, Sue Foley, Colin James and Ray Bonneville. His productions have won numerous Juno Awards, the Canadian equivalent of a Grammy. He also maintains an active career as a solo artist. Easin' Back to Tennessee is his tenth solo album, though not all have been released in the US. He is also part of a band called Blackie and the Rodeo Kings, which just released a CD, and which is apparently doing quite well north of the border. Throughout his career, blues and roots music have never been far from Linden's musical sensibility. The new CD puts him squarely in a style that basically inspired him to become a musician in the first place, and which he has been playing largely for himself over the years, acoustic country blues, in the tradition of Son House, Charley Patton and Blind Blake. He writes that he had been playing this style of music since he was eleven, when he had a meeting with Howlin' Wolf, who told him to listen to the people Wolf had been listing to. He did, and says he has been playing the music for over 30 years now. But until now, he felt he might not be ready to put himself on the line with the traditional style. He said that he first started considering doing a CD in this style about 15 years ago, and in the intervening years, has included a track or two like that on some of his own recordings. But this is his first release plunging full-bore into the traditional country style of blues, with acoustic instrumentation, and several pieces performed solo. He said he wanted to wait until he felt he had thoroughly absorbed the music. In his words, "I wanted to be old enough to be able to make a recording that was genuine, not me trying to copy the greats." The CD's mix is mostly traditional tunes, but there are some original pieces that fit right in with the old songs. Linden's backing band, consists of two gentlemen who have spent time in Tom Waits' band, bassist Larry Taylor, who also played in Canned Heat, and drummer Stephen Hodges. But there are also several solo tracks, in this CD that was made over a period of time in Toronto, Los Angeles, and Nashville, where Linden is currently based. The material ranges in sound from way down in the swamp, to almost Gospel. Linden's guitar work is, as usual, is very fine, mixing virtuosity with a feeling for the traditions and the willingness to keep it simple when appropriate. Canadian guitarist, singer-songwriter and producer Colin Linden has gone back to his musical roots on his new tenth CD Easin' Back to Tennessee. It's the music that has inspired him since his youth, but which he previously felt he might not be ready to do on his own, without sounding imitative. He accomplishes his goal on the new CD, embodying the country and rural blues traditions while maintaining his own identity. His mixture of traditional songs and original pieces which sound very old, maintains a pleasingly true and unpretentious sound. The sparse instrumentation, sometimes just Linden and his guitar, underscores the commitment to the spirit and authenticity of the music. For a sonic grade, though, the CD gets about a "C" from me. There is some apparently intentional distortion on the vocals and frequently on the guitar, and the overall sound is badly over-compressed, giving the CD an inappropriate "in your face" quality. That really undermines the clarity as well, yielding a sometimes muddy quality. As an experienced producer, Linden should have done better than that. Trying to be authentic with the music does not mean one has to emulate the bad sound of the early recordings. While there is an active revival of the blues, there are not many performers emphasizing the rural country blues style. Colin Linden does a great job in absorbing and re-channeling the music.